Patricia Anne Davis in NYC Opening ceremony for “WORLD YOGA COMMUNITY”, “International Day of Yoga Celebration” and 15th annual “Yoga Festival in New York City. I was taught an Esoteric Meditation that is called Raja Yoga, meaning spiritual mind power by strengthening the “Rainbow Bridge” from the intellect to the soul and I have practiced this daily for 40 years in order to sincerely manifest my soul purpose and life mission through meditation, learning and service in the world. 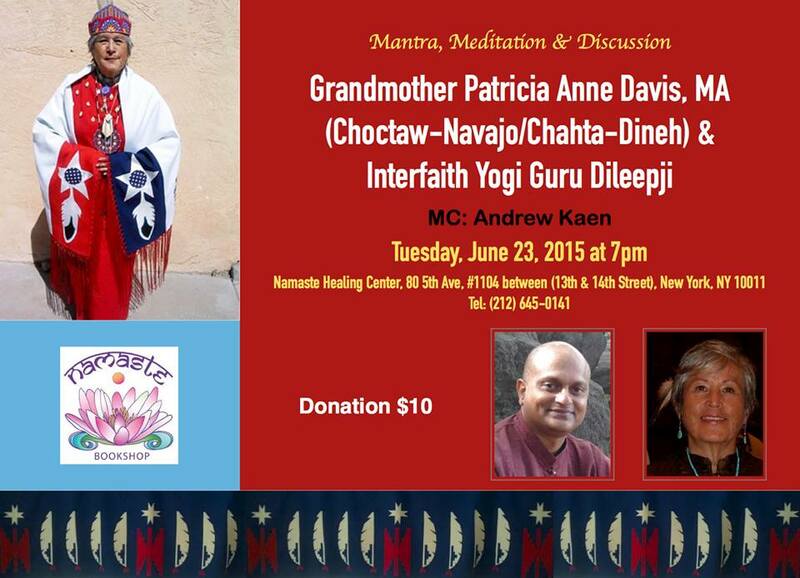 Now, as an International Teacher/Healer I am in NYC where East Indians meet an American Indian. This entry was posted in Ceremonial Change Process, Events, Native American Concepts and tagged Interfaith, International Day of Yoga Celebration, Rainbow Bridge, Two Disciples, WORLD YOGA COMMUNITY, Yoga Festival in New York City by Karah. Bookmark the permalink.